It’s hard to believe that it’s already been a year since Rich and I went to Maine, where I got to photograph Atlantic Puffins and the Milky Way for the first time. 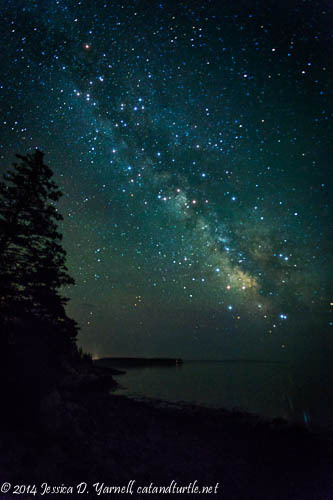 The light pollution in Florida is pretty bad, so we don’t get the opportunity to see the stars like we did in Maine. We were in awe. I can’t wait for my next opportunity to do some night photography. In the meantime, I found a great book called Nightscape, by David Kingham. It’s one of the many great Craft and Vision photography books. I really enjoyed the book, not only for the amazing photographs and inspiring location information, but also for the post-processing tips. So I hunted up my Milky Way shot from Mount Desert Island and re-processed it. David includes Lightroom presets to emphasize the color of the Milky Way, minimize the light pollution from nearby cities, and generally make the shot “pop.” I had a really great time playing with this old favorite, and I love my new take on it. ⟵Double-Crested Cormorant Still Looking Spiffy! Superb image! Now I’ve got another reason to be outside in the middle of the night besides listening for owls.